A Diabetic foot is a condition that develops in people having diabetes. The quantity of sugar or glucose is very high in the blood patients suffering from diabetes and this will cause nerve damage and poor blood flow which can lead to serious foot problems. The damage to the blood vessels will also mean that the feet do not get enough oxygen and blood. There is reduced ability to feel pain and hence the minor injuries may not be discovered by the patient for a long duration. If a patient gets a sore or any infection under these conditions then it is harder to heal. People suffering with diabetes are also at risk to develop a diabetic foot ulcer. Prompt attention to any infection or sore on your toe or foot can prevent the gangrene. When the wounds take a long time to heal, the infection may set in and the lower limb amputation may be necessary. The foot infection is the most common cause of the non-traumatic amputation in people suffering with diabetes. Wash your feet every day for any infection or cut, etc. Check your feet every day for any infection or cut, etc. The diabetic foot ulcer is a complex process which starts from infection, impaired vascular supply or neuropathy. The neuropathic ulcers develop due to the distal sensory loss and consequent foot deformity. The impaired vascular supply will lead to poor blood flow to the wound site that will lead to decreased blood supply in the area of infection. The wound healing process will involve several cytokines in combination with the paracrine factors and cell restoration is hampered due to metabolic disorders or diabetes. Mesenchymal stem cell therapy in India to prevent the diabetic foot ulcer is a cornerstone in the field of cellular based therapies. MSCs have the capacity to form angiogenesis or tissue regeneration, activate the wound healing function of the resident cells and immunomodulate the immune system. In addition to MSCs, the combination of platelet-rich plasma can produce a symbiotic effect in wound healing process. Medical intervention involves intramuscular (IM) injections and intravenous injection (IV) from the umbilical cord mesenchymal stem cell therapy for diabetes foot. This is only a tentative intervention, injection and the cell type may change depending on the condition of the patient and this is subjected to your doctor’s medical review. The stem cell intervention will bring significant improvement to heal and decrease the wound size and the inflammation as well as ease the pain. These improvements may vary from patient to patient and it cannot be guaranteed. With the evolving science, there are many options available to treat such conditions. 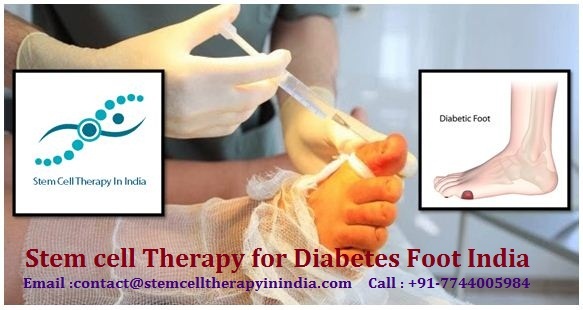 Stem Cell Therapy in India Consultants provides assistance to patients seeking the stem cell therapy for diabetes foot India. Send us your detailed medical history, test reports to get your initial consultation with our doctors and ascertain whether you are eligible for a stem cell therapy for diabetes foot India. Get in touch with us by filling up a free consultation form on our website to get the Offer on stem cell therapy for diabetes foot India this New Year.